Sometimes, it's not the big picture, but the close up that counts. This is a very nice home. But you'd probably drive by it at 40 miles an hour and not think much about it. 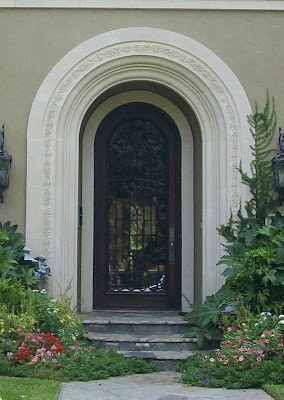 But upon closer inspection... you notice the detailed molding around the arched doorway. I think the wrought iron detail on the glass door is fantastic. And the landscaping around the entryway is divine in a messy and kind of overgrown way. It says, "I'm so delicious, I don't have to be edged every week. I defy the standard of your neat idea of perfection!" They say "the Devil is in the details". I think there might be some heaven in there too.